Shared Hosting is the most common form of website hosting offering a cost effective and convenient solution for small to medium sized websites. In shared hosting, the web hosting provider is responsible for the maintenance, management and security of a server which will house many websites. As the server is shared, the server management/maintenance fees to the web hosting provider are also shared making it an extremely cost effective option. Disk Space and Bandwidth size will not be big considerations as most web hosting providers provide adequate amounts for small and medium content oriented sites. Price will also not be crucial as the difference between the best web hosting providers on their most basic plans over a year is no more US $50. The number of domains offered by each provider is noteworthy – most webmasters, new or experienced, tend to create a number of different websites, especially when they unlock the earning capabilities of their sites. In this case, disk space and bandwidth become important as do scripts, e-commerce features and web design software. If growth is a priority or becomes a priority due to online success, it may be worth looking for web hosting providers that offer a number plans rather than just one. Transferring to a different web hosting provider rather than upgrading to a bigger plan with your current provider can be a difficult and complicated task. For all website owners and especially those with little or no experience, technical support is crucial. For most people, especially those that operate sites in addition to their 9 to 5 job, 24/7 toll free telephone support is important as is prompt email support. 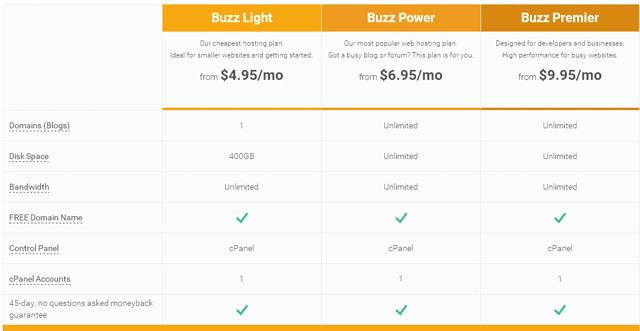 The best value for money in shared hosting is Web Hosting Buzz. Their one hosting solution costs $4.95 with no set up fee and a 45 day money back guarantee. The plan offers excellent features including 400 GB disk space, unlimited bandwidth, cPanel control panel, a wide variety of pre-installed scripts, software support and 99.9% uptime guarantee. They also offer the full range of 24/7 toll free and live chat customer service. In addition, Web Hosting Buzz also has online tutorials and stacks of online resources including forums, articles and answers to previously asked questions. Another recommended shared hosting provider is Arvixe Hosting. They are one of the most complete web hosting providers offering a range of shared hosting plans customized for personal ($4 a month) and professional websites ($7 a month). Their hosting plans are comprehensive containing a huge variety of features and scripts, and they have an excellent reputation amongst users and other web hosting providers. Their plans are rich with scripts and functions and you get to have unlimited disk space, uncapped bandwidth, free domain for life, and much more. Technical support is also great with 24/7 toll free phone support and live chat.